Three months ago, an earthquake measuring 6.7 on the Richter scale and lasting 20 seconds, ripped through the fertile desert oasis city of Bam, killing about 43,200 people and leaving thousands homeless. Over 40 international relief teams streamed to Bam, the UN launched a flash appeal and millions of dollars worth of donations poured in from across the world. Now, three months on, the emergency phase is over and the long-term rehabilitation is in full swing. But the last three months have been dogged by turmoil - there has been rioting in the desert city as well as public arguments over the distribution of funds, with some locals and aid officials claiming the government has been slow to release the money donated. 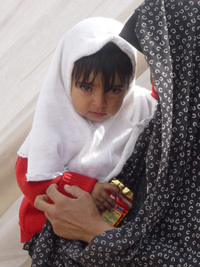 The 26 December earthquake was utterly devastating - most of the 90,000 displaced survivors have lost their livelihoods. Bam was a wealthy middle class city based on the twin economic foundations of agriculture and enterprise. Successful farmers prospered from the fecund oasis soil, growing dates and oranges for export. Many other Bamis were part of the booming tourism industry: people from around the world flocked to the ancient walled citadel of Bam, a labyrinthine city over 2,000 years old. The earthquake flattened the old city and it ruptured the ganats - the ancient irrigation channels that have watered this oasis of centuries. Farmers are desperately trying to restore their orchards, but with the hot season approaching there is not much hope - the natural springs are now ruined and the date trees will not receive the three tonnes of water a week they each need. 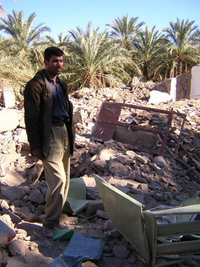 [Iran] A man surveys the damage to his damaged home in Bam. The signs of permanent damage are becoming sadly evident in the date groves. Three months after the earthquake, the palm fronds are turning brown at the ends. Some trees were shaken so badly that nothing can be done to save them. Farzad Hashemizadeh stands next to the wall of a palm grove owned by a neighbour. The groves are scattered throughout Bam, in communities like Baravat, which was one of the main date growing centres of the region. His face twitching with a tick developed from the trauma of the earthquake, in which he lost his only daughter, Hashemizadeh explains that the owner of the grove was killed but his son survived, and will try to resuscitate the garden when he recovers from his injuries. A ganat lies dry next to the wall. "The water used to run here every third day," says Hashemizadeh. "But there has been no water since the earthquake." Some of the roads into the city are now studded with mounds of debris that were piled on either side of the highway after being cleared. The piles stretch kilometres away from the city, but so much remains that, once inside the town, it is impossible to tell that any of the rubble has been cleared - the landscape of destruction looks almost unchanged from the days immediately after the quake. In many parts of the city, especially those where entire streets were destroyed, the debris is still metres deep, punctuated with shattered legs of furniture and household implements that point out from the mass of bricks. Small craters in the mounds of debris mark the places where bodies were found. Shelter is the most pressing problem now in Bam - with the hot season approaching, living conditions in tents will become intolerable. Along the sides of the roads, green and grey tents have grown up by the rubble of fallen homes. Neighbours have been drawn closer together, as they have been forced by deprivation to share food and water supplies. Although many of the tents are connected by wires, allowing electric lighting, they do not have more than the most basic of utilities. "Shelter is a major problem - there's an urgency to provide shelter before the heat sets in. There are still tents along the road and with the dust, sandstorms and heat, living conditions will be very bad," Elisabeth Settemsdal, head of the UN's Office for the Coordination of Humanitarian Affairs (OCHA) in Bam, told IRIN. 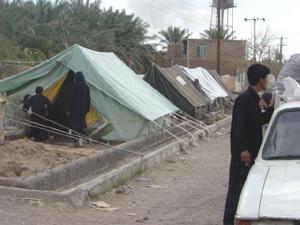 [Iran] Many people unwilling to go to camps. There is also a growing danger from scorpions and snakes as the hot desert season approaches. Work is now underway to build 30,000 prefabricated units and Mustafa Mohaghegh, the Iranian Red Crescent Society (IRCS) international relations coordinator, predicts that they will be finished in about two months time. 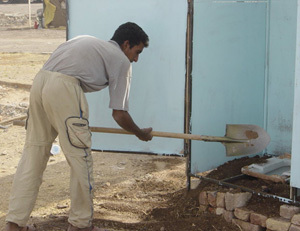 "Work on permanent shelter should start soon. We're not sure when it will finish, but it's a long-term process and should take around two years," Mohaghegh told IRIN. "To prevent another disaster like this, we need strong planning and standards for reconstruction and standardisation of homes," he added. Survivors are still reluctant to move away from the ruins of their homes and into tented camps. Apart from a deep emotional attachment to where their loved ones were buried alive, many are worried they will lose their land if they move away - their small plots are all they have left. A small number have also started working the land around their homes - mainly orchards which remained undamaged. "The government wanted to move everyone to camps so they could remove rubble, but they have revised that position and they are allowing people to clear ground and they will put up prefabs there," Settemsdal said. Some houses in the 20 surrounding villages are being rebuilt - World Vision is rebuilding 135 houses in Kork village, while Relief International is building 1,060 houses - foundation and structure only - in two other villages. The water network situation has changed considerably over the last three months. Immediately following the quake, the quality of the water barely deteriorated, because the wells - the major source of water to the city - were so deep underground that they were undisturbed by the earthquake. But now bad water is threatening the health of survivors. "There are no incidences of cholera but the number of water-related diseases - especially of water-related diarrhoea, has increased significantly as water quality in town pipes is decreasing," Settemsdal said. [Iran] Shortages of latrines in Bam. The United Nations is providing technical and material support - pipes, pumps, chlorination equipment, water testing equipment and water from tankers and in bottles - and is working with the authorities to ensure that the water distribution system reaches the planned sites for the 17,000 prefabricated housing units procured by the government. Waste management is still a problem, although now it is largely due to a gradual decrease in support from other provinces. The stagnant surface water and drainage is attracting flies and insects and for this reason insecticide is being sprayed extensively throughout the city. The United Nations Children's Fund (UNICEF) has bought 20,000 dustbins and 750,000 disposable plastic garbage bags. UNICEF is also concentrating on distributing latrine slabs - already, 2,000 squatting plates and plastic sheets are being distributed. So far, more than 850 latrine slabs have been distributed, with UNICEF providing technical support for construction and installation. The earthquake destroyed all the city's schools and re-establishing an education programme was a main goal. There are now 69 primary schools, 35 junior high schools and 23 high schools in Bam with 16,033 registered students in total. Basic educational activities in mathematics and reading, are beginning to take place to slowly reintroduce the formal curricula. UNICEF has provided 34 tents to be used as temporary classrooms, and Norwegian Church aid has donated coolers and whiteboards, to the education authorities of Bam. In the east of the city, six makeshift classrooms have been set up on what was the playground of a city school, three each for the boys and girls, aged up to 10. Nearby, about 100 tents, donated by the Turkish Red Crescent Society, stand next to a street which was entirely demolished by the quake. Lines of brightly coloured clothes hang between them. The school tents are dark inside and basically furnished with rows of benches and desks. [Iran] Bam earthquake - Ruins. Each has a blackboard, but there is little other equipment - schoolbooks and stationary were all destroyed and many of the city's teachers were killed. Those that remain are overworked and are paid with ration coupons that they say are inadequate to feed their families. Outside the school, children stand grinning in a queue. They are waiting for new satchels, each bursting with paper, pens, crayons, soap and sweets, donated by a local state-affiliated religious charity. They chase each other around the tents. The teachers say they have been very deeply affected by the disaster - many of them lost a parent, and 2,000 children were orphaned. 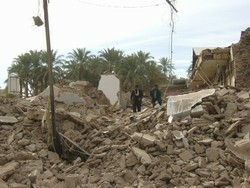 Their homes and the stability of pre-earthquake life have been lost. They now live like refugees in the very place their loved ones died. The teachers say the children always talk about the quake. Post traumatic stress disorder is widespread among survivors. UNICEF has advocated classroom activities to focus on the counselling of children, using play and recreation. Working with the health and education authorities, UNICEF is pushing forward a school-based counselling programme. "I don't see children happy and laughing, which is very, very frightful. They are sad - you can see the sadness on their faces," Olushola Ismail, UNICEF team leader in Bam, told IRIN. In partnership with the Ministry of Health (MOH), the UN agency is planning to give psychosocial assistance to the 25,000 survivors - both children and parents - of the disaster who are most traumatized. UNICEF and the MOH are training 1,500 teachers in psychosocial counselling, so they will be able to cope with traumatised children. The teachers' training commenced on 2 March, with 80 teachers participating. But the relief programme has also been beset by difficulties. International aid workers have faced suspicion from some government bodies, relief programmes have suffered from poor communication with central government, the process of building trust with survivors has taken longer than expected and there has been an influx of desperate people from neighbouring provinces in search of food and shelter. Aid workers complain that they are treated as spies and are constantly questioned and watched. They also find local bureaucracy a hindrance to their work. "Everything is centralised, you have to get approval from ministries in Tehran. As they don't have the same feeling of urgency that we have in Bam, it's a major hiccup," Ismail said. The arrival of thousands of poverty-stricken Iranians, from provinces as distant as Sistan-Baluchestan, seeking aid meant for Bam has posed a particular problem for the World Food Programme (WFP). "A lot of people have come to Bam from other areas and are taking advantage - it's a problem for the WFP as they agreed with the government that they would provide food for 100,000 people during a three-month period," said Settemsdal. "The IRCS, WFP's implementing partner, has registered more than 171,000 people for food distribution, covering the remainder with its own resources." Local dissatisfaction has spilled onto the streets: a demonstration, of Bamis angry at the slow pace of the relief programme, turned into a full-blown riot on 4 March. Gangs of young men set fire to cars and attacked government buildings. As the crowd approached the international camp, soldiers fired warning shots to ward off the protestors - the International Federation of the Red Cross hospital reported several injuries including gunshot wounds. "Nothing has happened in the last three months. I'm still in a tent and it's getting too hot to bear. I've had no food and no clothes. I have to buy these myself, although some friends from other towns have driven down and given us clothes," 32-year-old Amir Karimi told IRIN. The owner of a tourist bureau that now lies in ruins, he has turned his battered car into a taxi to provide for his wife and two small children. Depression has set in and Karimi and his remaining friends talk of little but those they have lost. Meanwhile, there are signs that the city is slowly getting back on its feet. Enterprising survivors have set up shop in the ruins: grocery stores in tents and furniture shops in partially damaged buildings - even a few coffee shops have emerged from the debris. At the Beheshteh Zahra cemetery, where about 30,000 people where buried in the first days after the quake, a sense of quiet but profound grief has replaced the immediacy of despair. The mechanical diggers, scraping out long trenches for use as mass graves, have gone. Now the cemetery looks smaller and neater, with concrete and brick covers put on the large graves, where tens of people were buried together. Where palm fronds had protruded from the graves, there are now black flags of mourning. But Beheshteh Zahra is still busy, as Bamis walk along its long avenues trying to make sense of the scale of death that hit their city. "On the first day of the Iranian new year [on 20 March] we went to Beheshteh Zahra with 35 volunteers. You could see the guilt," Hani Mansourian, programme manager for the Society for the Protection and Assistance of Socially Disadvantaged Individual (SPASDI), told IRIN. "People were hitting themselves and saying 'why should you go and I stay?'" Bam's future is uncertain, but the aid agencies are working to build a new city from the ashes of disaster. Over the next five years the UN will place the emphasis on risk reduction strategies across Iran to make sure the catastrophe Bam endured on 26 December will never happen again. But for the citizens of Bam the future looks bleak. Says Karimi: "We've got no future. Our lives are destroyed. We have nothing."